If you could only use one amp for all your guitar recording fun from now on, what would it be, and what features would it have? That might sound like a tough question – stupid, even, given the huge number of options there are to choose from these days – but if most of us deviate to a single amp for live use, then why shouldn’t one suffice for the studio too? Our top goal as guitarists (or at least, one of them) is achieving the ultimate tone, no matter where we are: onstage, in the practice room, at home, in the recording studio. And we all have a set of favorite tools that let us do this. It usually starts with the guitar, the instrument that defines us, and the accessories around it come a close second, tied with the playing ability and the tone that stems from our fingers and how we physically interact with our axe. But while most of us stick religiously to these main squeezes for live shows, why is it a totally different story when it comes to recording? It starts with the fact that the studio affords us time that the stage does not. Whether we’re at home in front of the DAW or in a studio with the band, there’s always another take, another chance to get things right. And that means another chance to tweak the tone again. There’s always another pickup combination we could try, a different overdrive pedal, or even a different set of power tubes in our amp. Now, we don’t have a problem with this. We love the experimentation, the studio dillydallying, that opportunity we have when recording to play around until we stumble upon that sweet spot which makes our guitar sound HUGE. Or tiny, if that’s what the song needs, of course. Amazing tone: The first and last point on the issue, really. If it doesn’t sound amazing, we don’t want to hear it sullying our records. End of. Tonal versatility: This is where things get more difficult. There are many amps that can do one or two things extremely well – and nothing else. Our perfect studio amp would be able to shine in any musical genre. And some unmusical ones, too. Manageable volume levels:Not a problem if you’re in a sizeable recording studio or have a dedicated cab room, but if you’re a home studio person you need an amp you can crank without alerting the noise police. Connectivity to the modern world: We don’t all have the skill – or the patience, or the budget, come to think of it – to spend hour after hour fiddling with mics to record our amps. We also want to be able to easily hook ourselves up to our 21st century studio equipment, and that means an integrated DI output, MIDI compatibility, a USB slot and/or wireless/Bluetooth technology. There now, that’s not too much to ask for, is it? There’s plenty more things we could think of that could go on a secondary list, of course – price (always a factor, whether we like it or not), built-in studio quality FX, serial/parallel FX loops, etc. – but those four points are absolute musts. The more features an amp has, the more useful it can be in a range of situations – live, at home, and in the recording studio. But if the tone’s not up to much, the extra bling means nothing at all! So, how to achieve what’s on the list? Well, for great tones, there’s only one way to go: tubes. We did whole dedicated blog about this very debate before (read that here) and the overall feeling was clear: to record the best guitar sounds, you need a tube amp, and not go down the route of a solid-state option or a digital modeler that kind of sounds like a tube amp. OK, OK. We know that digital’s getting better and better, and that many players are using it onstage and in the studio too. But as we wrote in that previous blog, we’d still always go tube if we could – it’s still number one in our eyes, and the eyes of most guitar heroes out there. We’d get round the versatility thing by having a multi-channel amp with plenty of tone-shaping options, and we’d back that up with external FX and the other features we mentioned in our secondary list. Volume’s more of an issue, especially if we’re insisting on tubes. Like we said, it’s fine if you got the space and the facilities, but if you’re at home with sensitive neighbors up, down, left and right of you, you need another solution. Happily, there are a few workarounds. First, a small amp – because they can do big tones too! In fact, plenty of amazing, huge sounding records have been cut with guitars running through poky little combos cranked to within an inch of their lives. Who are we to argue with Jimmy Page, Eric Clapton and Joe Walsh of the Eagles, after all? 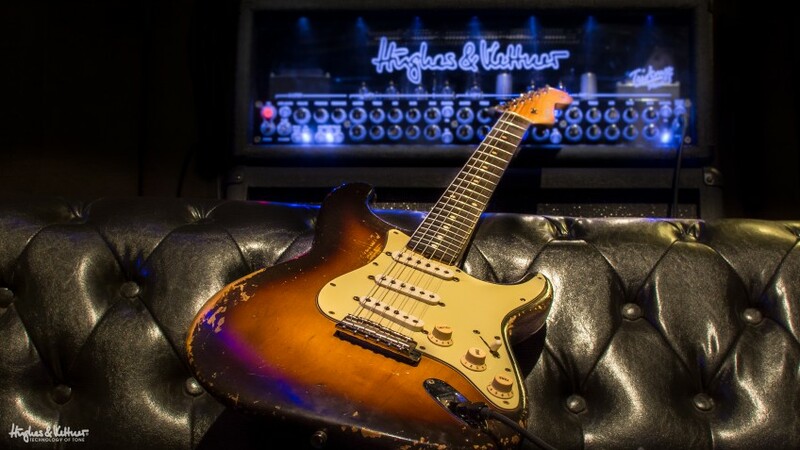 Of course, the perfect amp is just one cog in the perfect machine that you need to record an amazing piece of guitar-based music – but it sure is a great cornerstone on which you can build the rest of your all-important tone. But even smaller tube amps scream at far greater volumes than their corresponding solid-state and digital cousins. This calls, then, for a power soak: a simple tool that converts some (or all) of the amp’s power and volume into heat, resulting in drool-inducing tube tones at ear-friendly – neighbor-friendly – volumes. 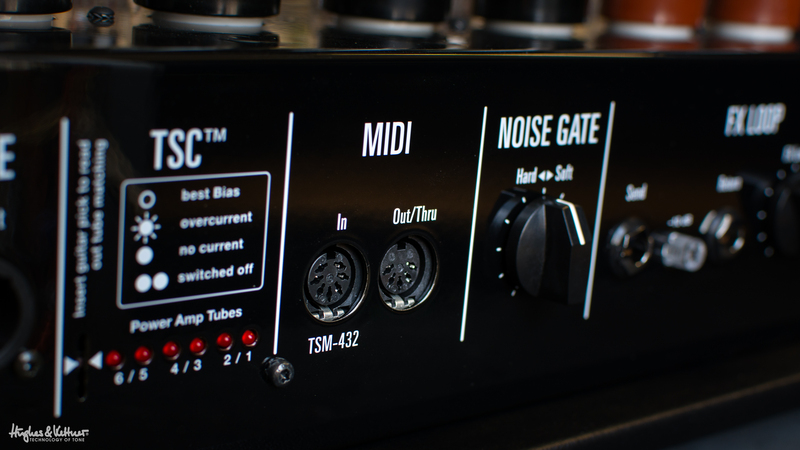 Finally, we’ve got the 21st century connectivity thing, and this is one point where tube amps have typically lagged far behind their digital peers. 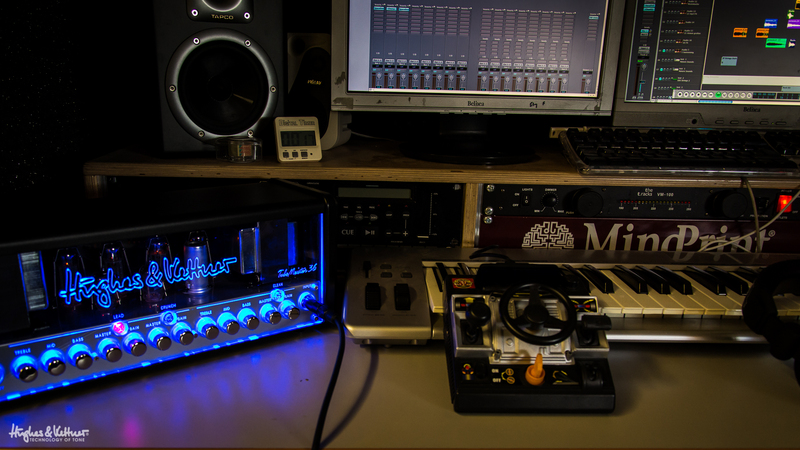 But that’s beginning to change now, with a number of amp makers bringing out tube-equipped beasts that are also right at home with DAWs and computer-based recording. What’s more, we’re pretty confident that things are going to get even better in this regard in the future too. Watch this space. All this said, we’re still not 100% sure it’s possible to make an amp that’s perfect for every recording situation. Sure, you can pack a load of great features into a forward-thinking tube amp that can roar like a wounded buffalo even at bedroom volumes. But the one thing you can’t legislate for is the famous irrationality of us guitar players. We love to tinker, to A/B, to try out other options. When buying a new guitar, we might try 10 identically specced Strats before we find the one that feels right to us. Or more. It’s a highly personal thing. But we’d love to hear your thoughts on the perfect studio amp. What bells and whistles would yours have? Would you go tube, or some other direction? Or does your ideal recording scenario involve a bunch of different amps, and not just one? Share your perfect studio amps in the comments below, and you never know… maybe one day we’ll get around to making some of them! First published: March 13 2015. Most recent update: May 15 2015. Should you record your music at home or in a ‘proper’ studio? Do you really need a tube amp to record the best guitar tones? I think the Triamp MKIII with a power soak would be it for me, based on owning a MKII. The MKII has that old amp sound, with a plethora tones available. It catches the vibes of those classic amps with a flair all it’s own. If the MKIII has that same three dimensional quality, it would be all I need to record. Six channels that encompass the spectrum of tones available, with the ability to feature or blend three different sets of tubes? Forget presets. That’s all I need. I have a place to record loud guitars though. A lot of you guys mention Tubemeisters, Switchblades, and Grandmeisters. I have a Tubemeister 18 and 36, a Grandmeister, a Switchblade head, Switchblade 50 combo, and a Triamp MKII. I used to have a Duotone as well. The Meister and Blade series sound great! Just great! The custom class amps are in another class literally. They have another dimension to them that clearly separates them. You owe it to yourselves as H&K fans to try them. They’re worth every penny. Sorry I went on so long. I’m a fanatic (and still have a lot of other brands as well). Hi Matt, and cheers for the great feedback (no worries for going on when you’re saying nice things like that 😉 )! We’re chuffed that you’ve had so many of our amps, and that you’ve enjoyed them all too, and we’d say you definitely need to give the TriAmp Mark 3 a go. We really worked hard with the new one to keep all the essential MKII features, but to move them up a notch. Making something totally new, but that at the same time was a continuation on the TriAmp theme – and yes, that includes those amazing three dimensional quality, as you called it. But this time, we think it’s even better! You know, we have had a few other people mention the power soak thing, and it’s definitely something we will consider for future models. Like you say, the Mark 3’s not one for home recording if you live in a quiet apartment block. Once again, thanks for the great feedback, and keep on rocking your H&Ks! Very positive response guys – may as well push my luck – can you put a genuine spring reverb in (the box is gonna be a bit bigger anyway) and can we have a fan (something is gonna melt in the GM sooner or later). Oh yes and a solo boost button on the footswitch even when it’s in preset mode…. You guys got very very close to the ultimate amp with the GM36 and should start with that. Put the triamp to one side – the engineers have had their year of over-indulgence and the twenty or so folks who are doing worldwide stadium tours will have one by now. Make the GM just a bit bigger – maybe 50/60 watts but critically including some extra valves/tubes from the 6L6/6V6 family in there. Then add a blend control between those valves and the EL84/34 type so we can each find our sweet spot combining the two types. Then get Bluetooth or similar connectivity with ipads/PC’s and a tonestack with more flexibility to tame trebles. All this and the long-awaited preset-sharing forum and you will sell a shedload I guarantee (well one at least…). Cool tips, John! Sounds like quite a Meister, so we shall definitely pass these ideas on to the boffins. That blend control feature sounds awesome, and we know it’s been heralded by users of other amps too. Combining those tones with those other features you mention and we’ll be on to a winner! It’ll be an indulgence of the more generally practical kind 😉 Cheers for the feedback! I guess you guys are allready on a good way. I really like what you created with the Switchblade. Trying different sounds is so much easier, when you can save and recall settings. Unfortunately most modern Amps are still lightyears away from the old tube grandmasters when it comes to sound. 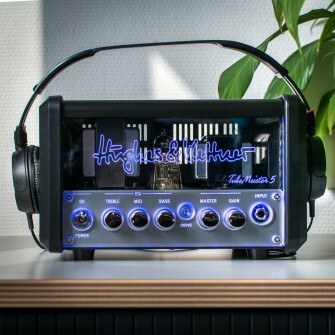 So the perfect amp in my opinion would offer all modern goodies combined with the headroom of good old Hiwatt amps, the pristine clarity of old Vox Models and the badass Lead of 80s Marshalls, while having the great looks and flexibility of todays H&Ks. Not an easy goal I have to admit, but if anyone can do it, you can. Cheers for the feedback, Toni! You’re right, that doesn’t sound easy, but what you describe there is our goal – making amps that can do it all for you guys. One part’s no good without the others though (amazing tone is useless if you can’t harness it effectively, and loads of features are worthless if the tone’s no good), hence the work been constantly ongoing 😉 Keep on rocking! Maybe it should be called that! I have a Hughes & Better TubeMeister 36….. It is an awesome studio amp AND the Most Versatile Live amp that I’ve EVER USED!! !